All of the papers, canvases, and inks we use are acid free and archival. Our Epson Stylus Pro 11880 wide format printer uses Ultrachrome K3 ink techonology. This pigment- based ink printer contains 9 different colors offering a wide color gamut. 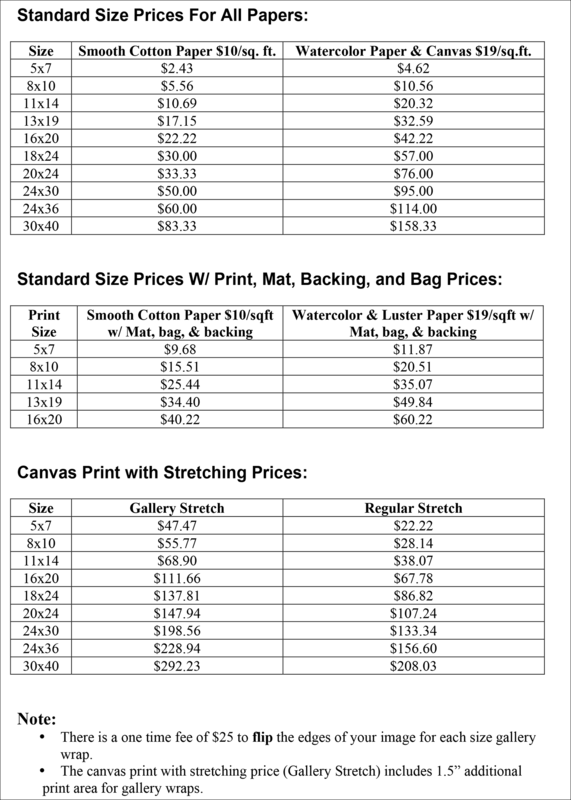 Maximum printing width for Regular Stretch canvas is 60" (if being framed). 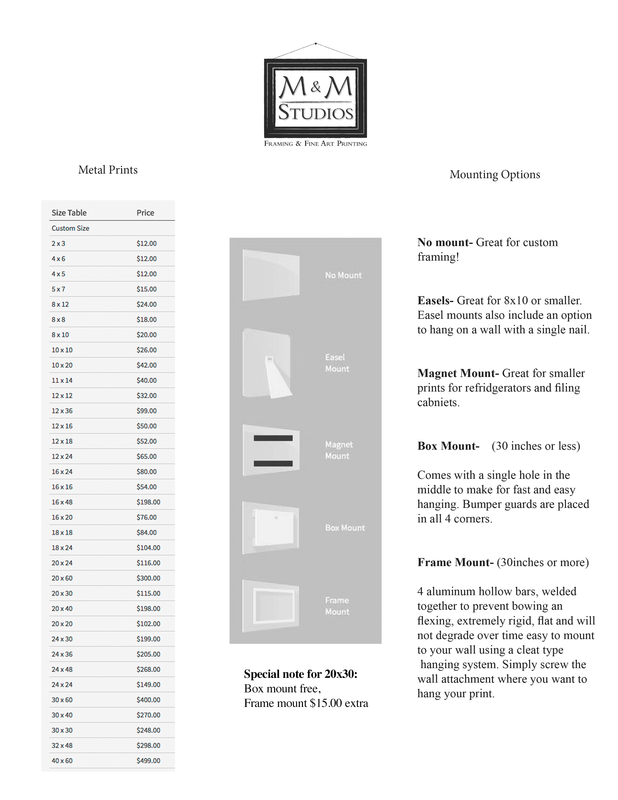 Maximum printing width for Gallery Wrap canvas is 57" (with colored or mirrored edges). 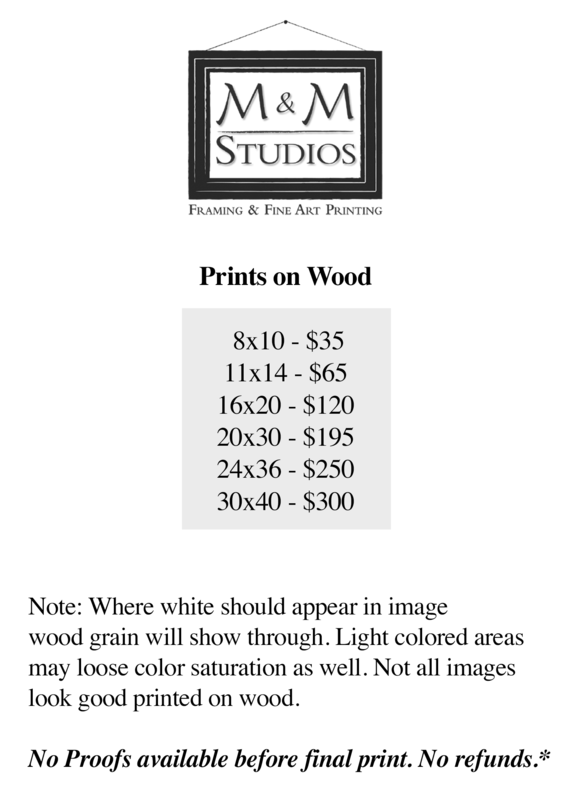 Maximum printing width for Gallery Wrap canvas is 60" (with white border). Formulated with an ink receptive coating that sets the standard for color. This easily top coated surface and smooth texture are perfectly suited for Fine Art Reproductions, Giclees, Photography and more. *We spray all of our canvases with a water-based liquid coating to provide enhanced UV- protection, as well as chemical and abrasion resistance. Available in Semi-matte or Glossy finish. A smooth surface that suits detailed work and watercolors. The perfect choice for posters, commercial displays and photo portraits. This photo paper features a unique metallic surface look that provides an extreme sharpness and depth. For photographers seeking a flat matte surface this is an ideal choice. For photographers seeking a new and unique surface with no framing necessary. This dye sublimation process works well with images that have high color saturation and vibrancy. White Gloss- Very eye catching, contains glare. White Matte- Flat Matte surface, contains hardly any reflection/glare. Clear Gloss- The texture of the metal surface shows through in this finish, especially where white should be.